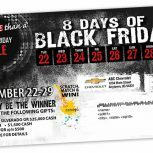 Black Friday Direct Mail is Here! Why send Black Friday Direct Mail? 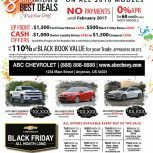 It’s the time of year for sales and deals! 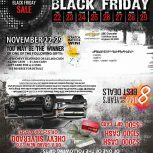 Black Friday kicks off the shopping season, and it’s a prime time to get your message out there in the hype of it all! 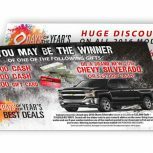 A unique direct mail design and targeted offers to the most likely consumers are a winning combination for drawing in profits, come the holiday season. Our professional account managers and creative team will happily work with you to best create a Black Friday direct mail campaign that gets customers in the door and helps you to return the best results for your business! Kick off the Holiday shopping season right with personalized direct mailers for Black Friday Deals! Give us a call today at 1-800-826-2869 to get started!